Explanation: These two mighty galaxies are pulling each other apart. Known as the "Mice" because they have such long tails, each spiral galaxy has likely already passed through the other. The long tails are created by the relative difference between gravitational pulls on the near and far parts of each galaxy. Because the distances are so large, the cosmic interaction takes place in slow motion -- over hundreds of millions of years. 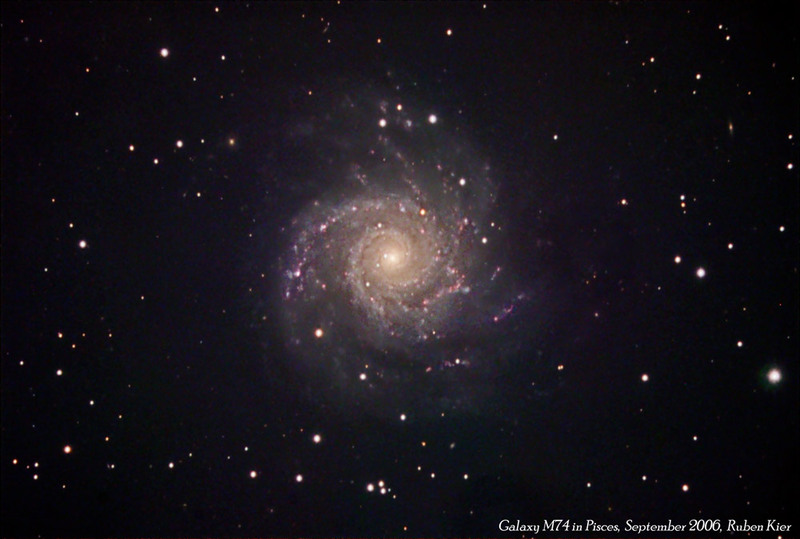 NGC 4676 lies about 300 million light-years away toward the constellation of Bernice's Hair (Coma Berenices) and are likely members of the Coma Cluster of Galaxies. The above picture was taken with the Hubble Space Telescope's Advanced Camera for Surveys in 2002. These galactic mice will probably collide again and again over the next billion years until they coalesce to form a single galaxy. We see our Magellanic Clouds. Imagine what astronomers in either of those two galaxies see! It is doubtful that there are very many astronomers in those galaxies except those who might be passing through on their way somewhere else. The same forces that pulled those galaxies into tails will also have significantly disrupted the planetary systems of the stars in those galaxies. If Earth were dragged into an elliptical orbit that went from Jupiter to Venus, how many of our children would be interested in looking at stars before the Earth was finally ejected from the Solar System? This brings up the question of how disruption of orbits has been factored into the calculations of how probable life is. We know that a single close encounter can disrupt the Oort Cloud causing extinction events. Can anything that doesn't have independent propulsion through space survive galactic collisions? DaleA wrote: This brings up the question of how disruption of orbits has been factored into the calculations of how probable life is. We know that a single close encounter can disrupt the Oort Cloud causing extinction events. Can anything that doesn't have independent propulsion through space survive galactic collisions? That's a valid question, but so is this: With the average separation between stars being so vast that stars almost never collide during these galactic merger events, how likely is it that a habitable planet's orbit would be drastically effected? Sure, bodies in Oort Clouds way out where the star's gravitational pull is weak would be perturbed, but what about planets inside habitable zones where the star's gravity is strong? Dale, I'm glad you raised this issue. It's helped me to realize something fundamental about universal habitability. The vast distances between the stars increase the odds of long term habitability. Indeed, this may be required for merger events to be survivable. DaleA wrote: It is doubtful that there are very many astronomers in those galaxies except those who might be passing through on their way somewhere else. The same forces that pulled those galaxies into tails will also have significantly disrupted the planetary systems of the stars in those galaxies. Certainly there are regions of a collision like this where the stellar density becomes high enough that planetary systems would be tidally disrupted. But not, I think, very many. The majority of planetary systems in these two galaxies are likely to survive the collision largely unperturbed. Yes. Extinction events don't appear to end life. Arguably, they make life more diverse. This is an argument for the survival likelihood of individual species, and therefore for stable intelligent life. But not life itself. hoohaw wrote: We see our Magellanic Clouds. Imagine what astronomers in either of those two galaxies see! Not much. From inside these galaxies, it would just look like a single galaxy. The view would be similar to what we see here- a dark sky with regions of gray glow. Typically, not much. If the galaxies merge, the black holes end up in orbit around each other (along with the rest of the galactic contents). If the galaxies pass through each other, the black holes are likely to stay with the bulk of the original material in each case. It is possible for supermassive black holes present during galactic collisions to enter extremely tight orbits and ultimately merge, but this is statistically unlikely. It is also possible for one or both to be ejected (something which has been observed). But again, this is statistically unlikely. Supermassive black holes still represent just a tiny fraction of the total mass of these galaxies. DaleA wrote: Can anything that doesn't have independent propulsion through space survive galactic collisions? And also WE already have "independent propulsion through space". Very soon too, (especially on the time scales of these collision events) we will have the ability to ward off the threat of cometary collision, and this after only a very short time as a technological species. If we can do it, how hard really is it? BDanielMayfield wrote: And also WE already have "independent propulsion through space". Very soon too, (especially on the time scales of these collision events) we will have the ability to ward off the threat of cometary collision, and this after only a very short time as a technological species. If we can do it, how hard really is it? I think we are a far greater risk to ourselves than comets. If we can survive ourselves, I guess we'll find out sooner or later how hard it is to ward of comets. I agree! I love the beautiful almost "M74-like" face-on one at about 6.30. I've been trying to work out (or find out) how far apart the two galaxies are -- their approximate center to center distance. I have figures for their distance from here -- about 290 ly or 89 Mpc -- and for their angular size -- about 2′.3 × 0′.7 for one, and 2′.2 × 0′.8 for the other. But my memory is not stirring when it comes to changing their angular size to ly, and therefore to be able to estimate their distance from each other. (Also, I'm not sure how much of each tail is included in the given angular sizes.) Any number crunchers able to help? rstevenson wrote: I've been trying to work out (or find out) how far apart the two galaxies are -- their approximate center to center distance. I have figures for their distance from here -- about 290 ly or 89 Mpc -- and for their angular size -- about 2′.3 × 0′.7 for one, and 2′.2 × 0′.8 for the other. But my memory is not stirring when it comes to changing their angular size to ly, and therefore to be able to estimate their distance from each other. (Also, I'm not sure how much of each tail is included in the given angular sizes.) Any number crunchers able to help? Since as you point out the tails make us unsure about the lengths of these galaxies I'd use their widths, which are about the same, 0.7' and 0.8' to come up with a scale. But again, where are the endpoints even for the widths to be taken? Just as a guess I estimate the center to center angular distance to be about 1.5' Rob, but this could be way off. Using trig we have Opposite side = Adjacent side x Tanget (adjacent angle) = 290 ly x tan(1.5') = 7.6 ly. Hey, that can't be right. How about 290 million ly which would give 7.6 million light years, plus or minus several million. Edit: shame on me I used 1.5 degrees of arc, it should have been 1.5 minutes: 290,000,000 x tan(1.5/60) = 126,500 light years. BDanielMayfield wrote: Edit: shame on me I used 1.5 degrees of arc, it should have been 1.5 minutes: 290,000,000 x tan(1.5/60) = 126,500 light years. Thanks Bruce. That's why I asked someone else to do it. So they are a little closer than the distance between the Milky Way and the closer of the two Magellanic Clouds, and almost twice as far apart as those same Magellanic Clouds are to each other. That's what I was hoping to get, some perspective on the Mice, by referring to local objects. Your welcome Rob. Actually though, what I came up with would only be close to the real distance between these two galaxies centers if they are the same distance from us, which is unlikely. Having reasonable estimates for both galaxies individual distances from us, along with the separation angle would be required to estimate the actual 3D distance between them. Then one could use the Law of cosines: c2 = a2 + b2 - 2ab cos(C) to solve for the real distance. I would like to ask an off topic to this but I just saw the vid of a photon traveling thru the solar system at the speed of light. Would it be correct to say the places " behind this photon " would actually be dark ? ta152h0 wrote: I would like to ask an off topic to this but I just saw the vid of a photon traveling thru the solar system at the speed of light. Would it be correct to say the places " behind this photon " would actually be dark ? It gets really weird. The "behind" and "in front" don't make a lot of sense to a photon. ONCE AGAIN, for the non-scientists who read/write APOD - by definition galaxies are composed of NON-COLLIDING (stars) objects. By extension, galaxies CANNOT collide. Allow yourselves the joy and wonder of science to ask questions and imagine the unimaginable without relying upon trite, figurative delusions. This is one of the most misinterpreted systems in astronomy. If you want to write something authoritative then help debunk this myth about NGC 4676. There is plenty of data available. graystoke wrote: ONCE AGAIN, for the non-scientists who read/write APOD - by definition galaxies are composed of NON-COLLIDING (stars) objects. By extension, galaxies CANNOT collide. Allow yourselves the joy and wonder of science to ask questions and imagine the unimaginable without relying upon trite, figurative delusions. This is one of the most misinterpreted systems in astronomy. If you want to write something authoritative then help debunk this myth about NGC 4676. There is plenty of data available. Is this kind of like saying I can never hug someone because our atoms don't actually touch? Of course galaxies can collide. As colliding structures they occupy the same volume of space. Some of their contents (gas and dust) collide directly, releasing energy and leading to new star forming regions. A small number of stars will collide, many more will be perturbed, both structures will be significantly altered, and their central black holes may merge. "Collision" seems like a perfectly accurate word to describe that! I got in my time machine and was able to get on-line to the James Webb space telescope. I was amazed to see this view with better magnification.